~ Mommin' and Bloggin' from Bend, Ore! 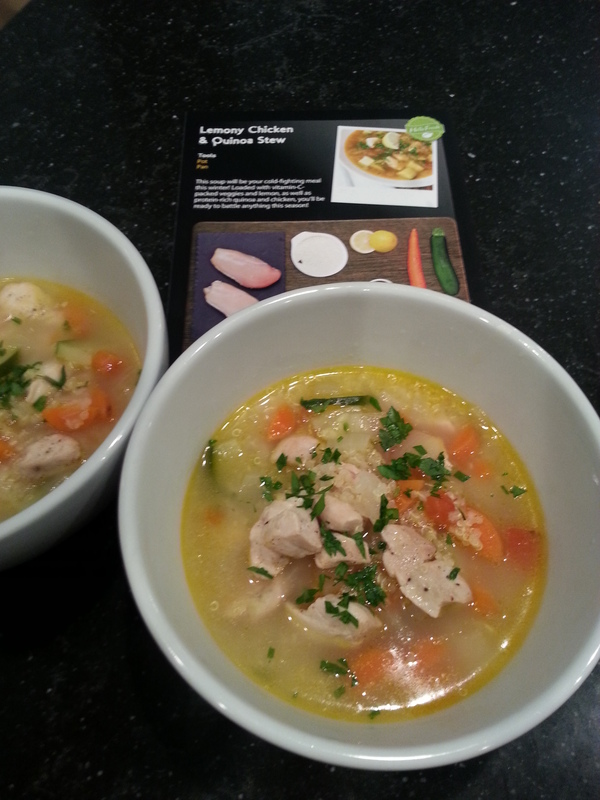 Winner Winner (Lemony) Chicken Dinner! We Tried Three Different Meals Services! Part 4 of 4! This post finishes a 4-Part Blog Series on our experiences and reviews of three (3) Meal Delivery Services : We attempted to use each service for two weeks. Thanks for joining me and my family on this culinary journey! I received a $40 off marketing postcard in my Parent’s Magazine subscription. Let me offer you $40 OFF your first box!!! 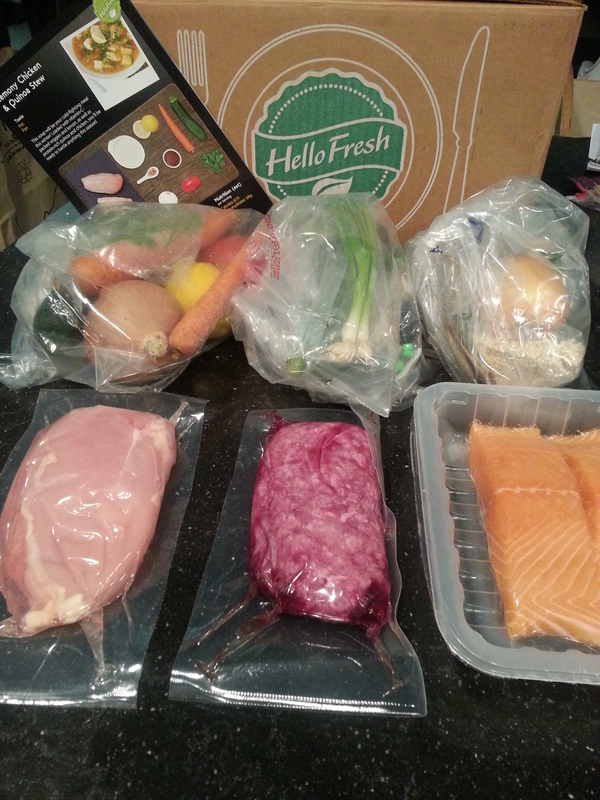 HelloFresh offers 3 days of meals for 2 people (this is what ‘a week’ consists of). Additionally, there is a 4 person meal option. 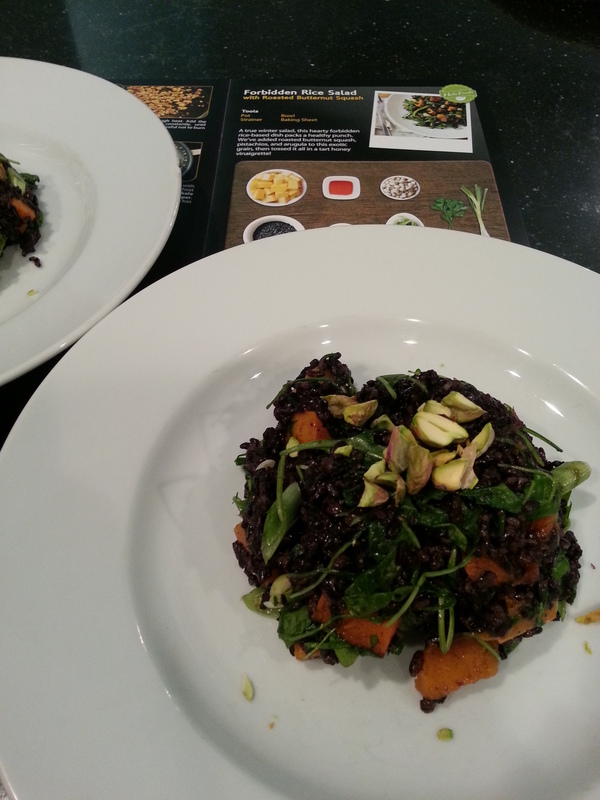 The meals range from 500-800 calories, include farm fresh ingredients, and offer a Flexible Subscription option. ~ Farm Fresh ingredients, including hormone free meat. ~ Can choose 3 of 5 meal options per week. So, you’re not ‘boxed’ into the 3 meals they choose for you! ~ Beautiful Recipe card booklet with pictures of completed dishes. Features a “Let’s Talk About” page on the back : Grains, Beans, Leafy Greens, Nuts & Seeds, etc. ~ One can choose a Vegetarian Option, which is slightly less expensive. ~ There is no ‘Dietary Profile’. Though, one can chose to go with the Vegetarian option, if needed. We do have a few restrictions…some Gluten-Free, some Spices, and some Seafood. Luckily, we can choose out of 5 meals, so I pick three meals that are more catered to our needs and modify as desired. ~ Most meals took about 35 minutes to prepare. ~ Meals were acceptable to most of my family’s tastes. ~ Meals could be Gluten-Free! 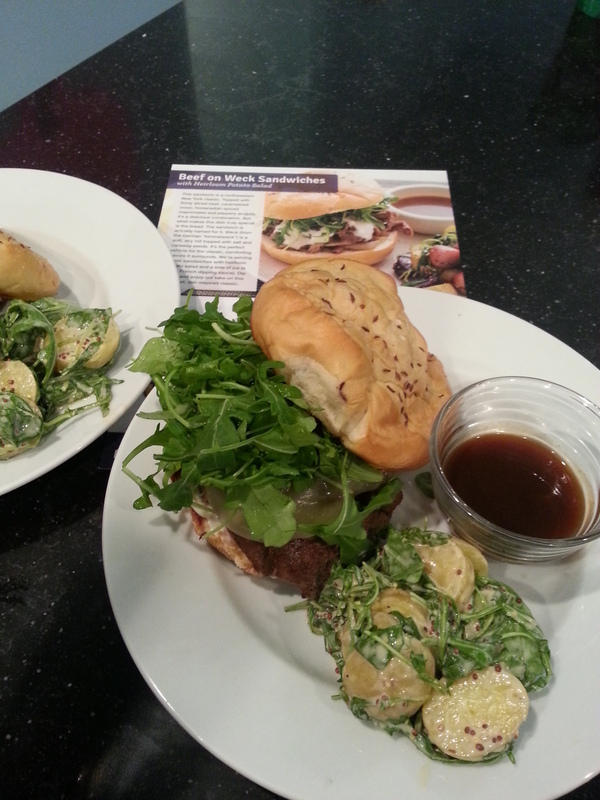 ~ I chose recipes that would get my foodie brain thinking about new ways to cook. We, also, had HelloFresh delivered during the Holidays…family in and out, schedules up and down made us want ready-to-cook meals! OMG! I am still thinking about this meal! I have no idea why I haven’t recreated it yet! Don’t forget my offer : $40 OFF your first box!!! 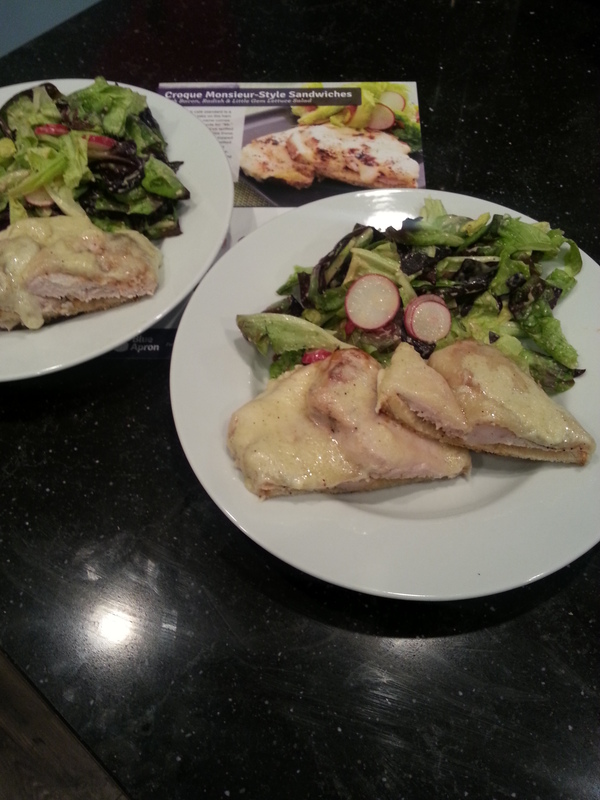 HelloFresh Review! Tried Three Different Services! Part 3 of 4! Here’s HelloFresh…I’m writing a 4-Part Blog Series on our experiences and reviews of three (3) Meal Delivery Services : Reviews and Pictures of each service, in order in which we used them. We attempted to use each service for two weeks. I will complete the series with a recommendation of our preferred service!! Basically, the Winner! ~ Actually offer a ‘recycling’ return for their padded box liners. ~ ‘Recycling’ return is not all that, but at least it was an option available to me vs. throwing out or dumping into my recycling. I returned 3 weeks worth of box liners at the cost of $26 via UPS, and received a $16 credit on my account. So, I didn’t even get a credit equal to the cost of shipping, but at least I got some sort of credit. ~ Our first box has a couple frozen veggies, which they promptly credited me for. Korean-Style Beef!? Heck Yeah, bring it! And, yes, it was good! We love a good Asian-inspired meal in our house and this met the expectation. And, yippy, they used Brown Rice! 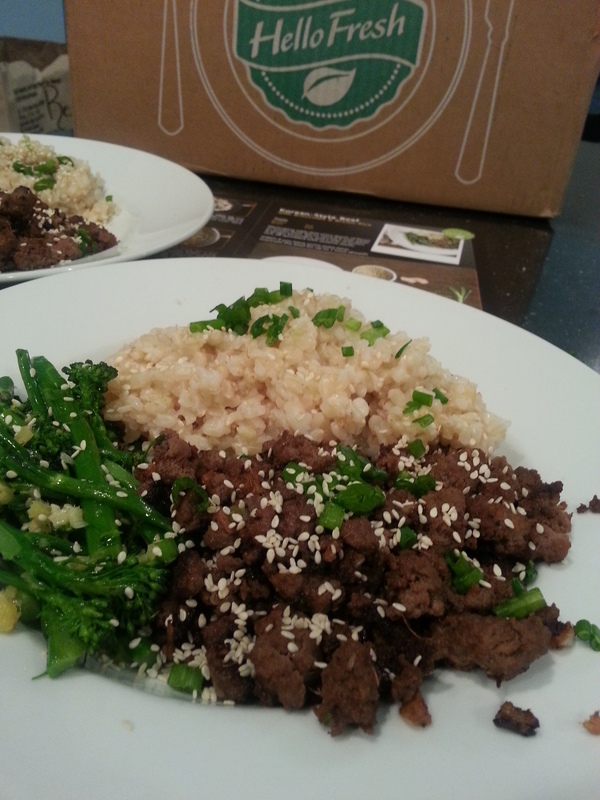 We only use Brown Rice in our house, so it was nice to see a meal delivery service do that same. 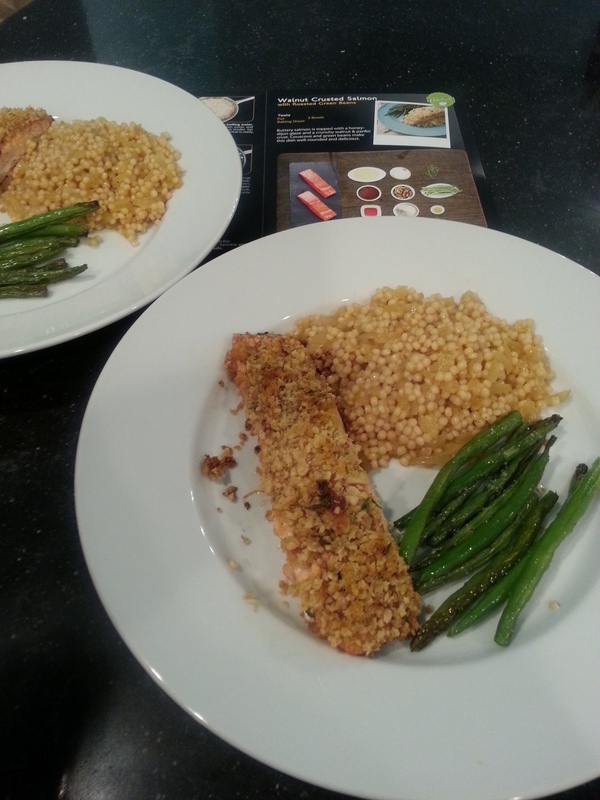 This was good, it was not gluten-free…but I loved the walnut crusting idea. This was surprisingly delish and I didn’t expect it to be so! The flavor and texture worked so well together. Modifications : Did not use the Chili Flakes. Delicious and gluten-free. I’m not typically a fan of sweet along side my savory dinner, though I know it’s ‘tradition’ to have apples/applesauce with pork chops, so I knew the deal. 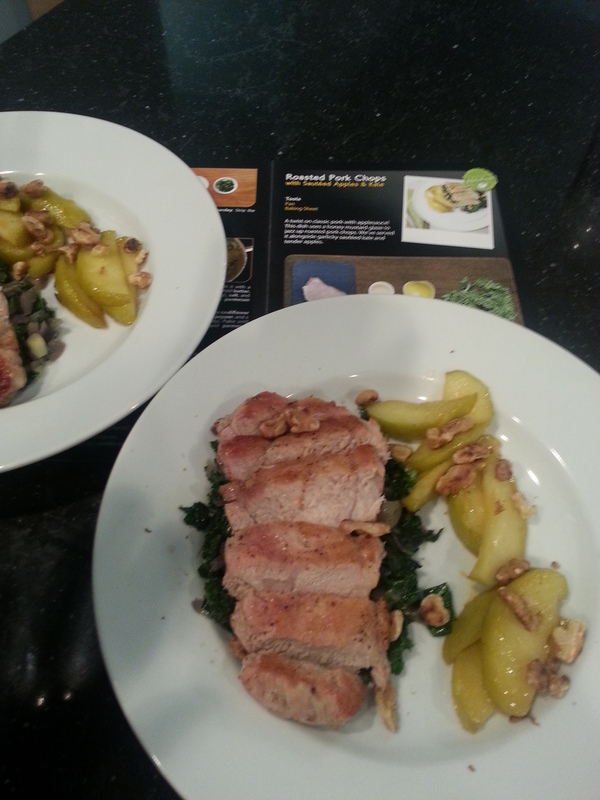 Though I loved the addition of kale and then I served mine up with the nuts garnishing the apples vs. the kale. I messed up and made more of a puree vs. a mash, though it turned out lovely to have an awesome sauce to go with this dish. So…basically…the dish was Awesomesauce! Good…I didn’t really know what to expect, but I’d really wanted to try Forbidden Rice. Thus, I was super happy to have this as a menu option. Modifications : Added Chicken to hubs and nephew’s portions. 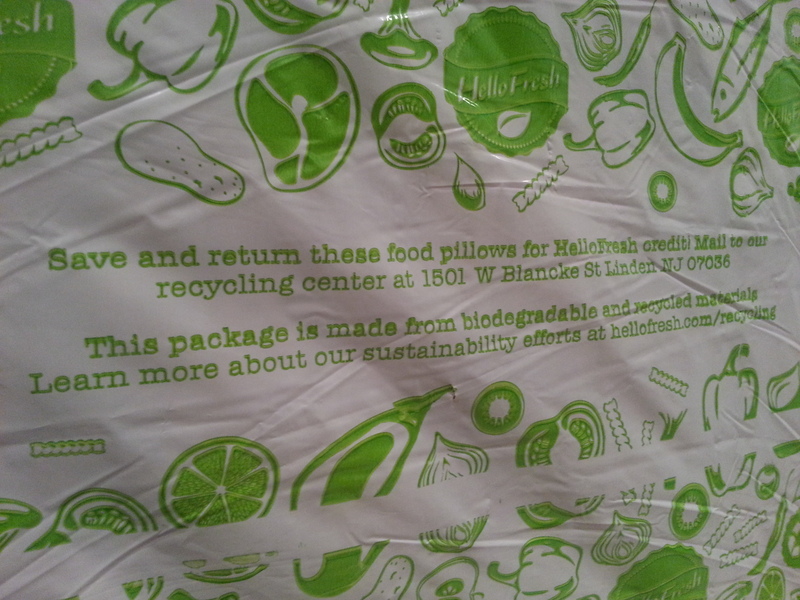 Even though the cost of sending in the recycling material did not match the credit I got, I am happy that is an option. We, also, tried HelloFresh during the Holidays…family in and out, schedules up and down and a credit sitting in my account prompted us to go for another week of HelloFresh meals! Gluten Free and pretty tasty. Not to shabby and Gluten Free. OMG! I am still thinking about this meal! I have no idea why I haven’t recreated it yet! I’ll be posting Part 4 : THE WINNER! WINNER WINNER CHICKEN DINNER! I can’t wait to tell you! 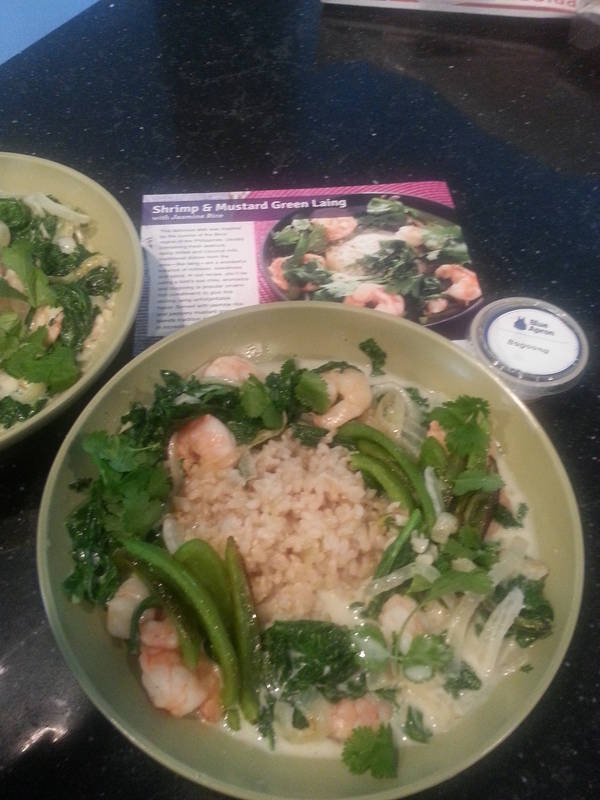 Blue Apron Review! Tried Three Different Services! Part 1 of 4! I’m writing a 4-Part Blog Series on our experiences and reviews of three (3) Meal Delivery Services : Reviews and Pictures of each service, in order in which we used them. We attempted to use each service for two weeks. 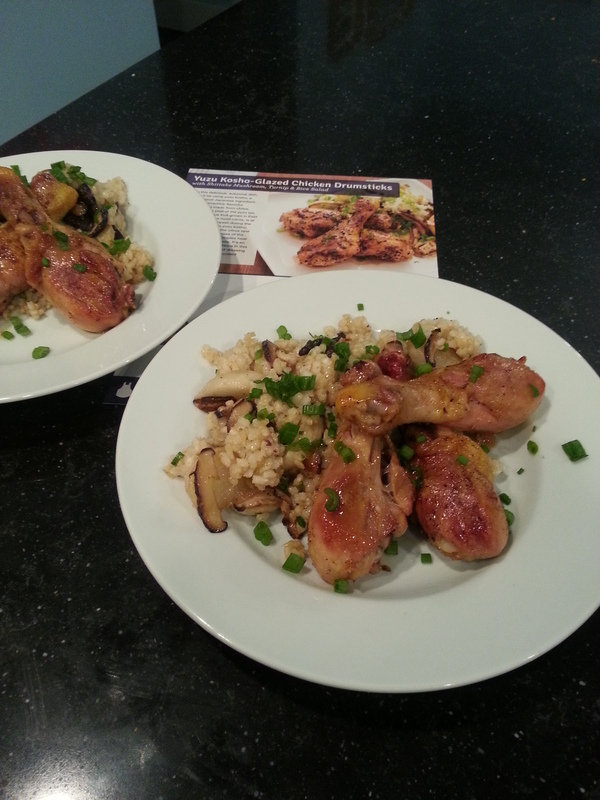 A mama friend sent me a referral link for a week of free meals with Blue Apron! How could I not go for that!? Having a toddler makes meal-planning a tad bit ‘cumbersome’…and, even though, it was CrockPot season, I thought it would be nice to have meal options ‘outside the pot’. 🙂 I quickly signed-up! Also, I love to cook and wanted to get some inspiration! I was only offered the option of delivery on Thursday or Friday. I wanted something earlier in the week to allow for spontaneous weekend dining out, without worry of spoiling meals in the fridge. 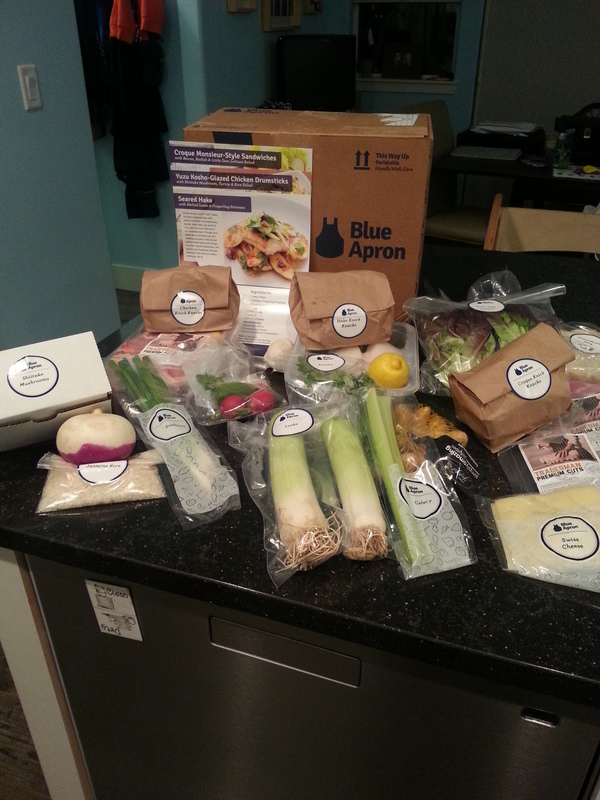 Blue Apron offers 3 days of meals for 2 people (this is what ‘a week’ is). The meals range from 500-700 calories, include fresh ingredients, and are suppose to take about 35mins to make. All for $9.99 per meal…so, $59.94 per week! After you’ve been with them for awhile they offer a referral link to send to friends. But I moved on after two weeks (one paid week) to the other services…thus, they did not offer me a link to share with my readers! ~ Fresh ingredients, including hormone free meat. ~ Quick prep recipes…most were fairly true to around the 35min completion time. ~ Beautiful Recipe cards with pictures of completed dishes. Includes a little history of the dish and are reusable! ~ Late delivery…in week AND time of day! The earliest day we could receive our box, at the time, was Thursday! So, I waited all day on our first Thursday…and dun, dun, dun…received our box at 8:40pm (Eight-Freaking-Forty!). Needless to say, that first night’s dinner was not a Blue Apron dinner and our Toddler went to bed a bit later than normal! ~ Packaging Waste…sorry but this makes me cringe. Though I was able to pass along the cold packs and foiled bubble wrap to local fisherman and such. ~ Recipes that were not true to the 35min time…were so far off! Nearly an hour! ~ The ‘Dietary Profile’ is limited and only offers the opportunity to select main protein sources : Beef, Poultry, Fish, Lamb, Pork, Shellfish. We do have a few restrictions…some Gluten-Free, some Spices, and some Seafood. I’ve seen this on the menu at our favorite French Cafe in Redwood City, Ca. Pamplemousse. Though I’d never ordered it myself when we lived there! Boy, was I missing out, this was delicious! 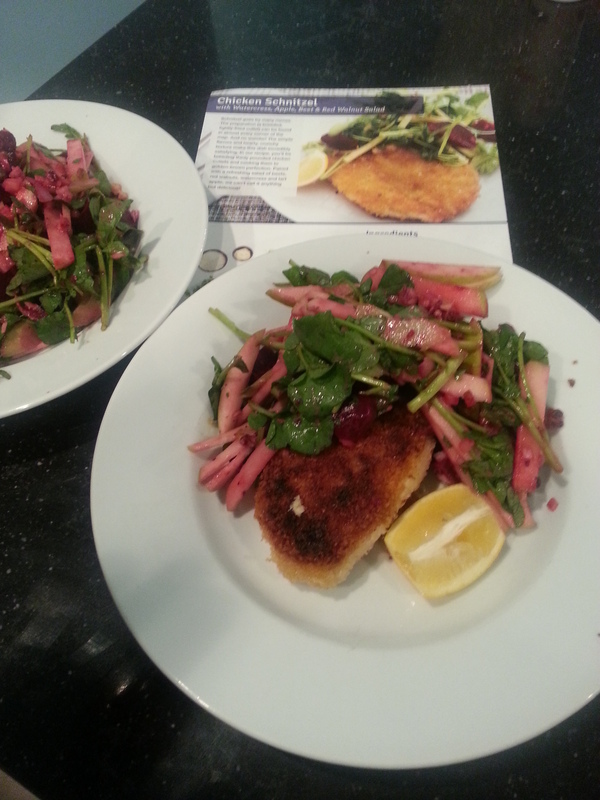 Blue Apron portions were big and the salad was huge! Modifications : Bacon on the side, Substituted Provolone for the Swiss. 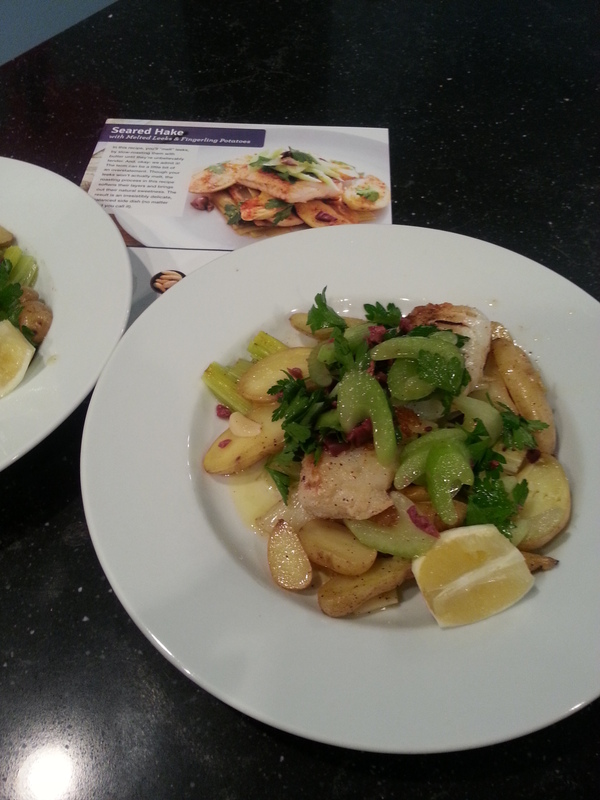 I am a Leek and Potato girl, and hubs is a fish guy…so this meal was so our style! However, the prep took forever and our total time was 50+ minutes before we ate. Thankfully we ate it at lunch and, thus, weren’t set back for a late dinner. 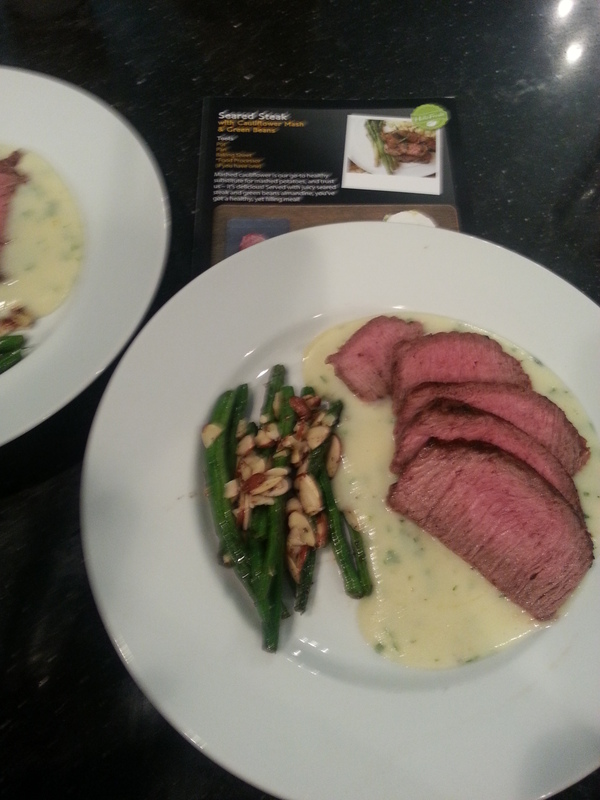 This was another wonderful dish that is very much our style. It had a wonderful flavor and was one that our toddler enjoyed as well! There was plenty of food for more than the allotted two servings. Modifications : Substituted Organic Brown Rice for the Jasmine, Added Extra Sesame Oil, Omitted the Togarashi Spice Blend due to being unsure of Paprika, would have loved more Ginger. Oh. My. Goodness! This was good! We didn’t know what to expect, and we were pleasantly surprised! The delicious crunch of the airy bread was just too amazing! However, the beef was thinly sliced vs. shaved, as was stated in the ingredients…shaved would have been so lovely! Plus, I looooove Arugula! Modifications : Panfried Bread in Butter vs. warming in oven, Added Mayo to Potato Salad, Added provolone to sandwich. Ohhhh…yeah…this is our style, I mean Hubs is Filipino, afterall! This was good and tasty, I loved the shrimp with the sauce, and the freshness of the cilantro was amazing. Modifications : Substituted Organic Brown Rice vs. Jasmine Rice, Needed my own Garlic (as it was not in the box! ), Kept Bagoong on the side for hubs to eat as desired! This was so yummy…just straight up goodness. Modifications : Surprisingly, no modifications…that is so rare for me!! Very good, except for the late deliveries. 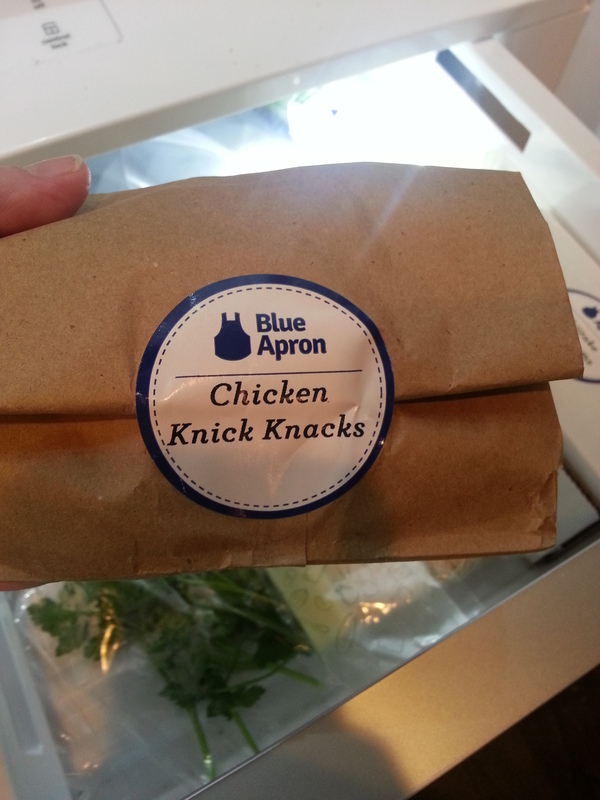 I love how they have little brown bags labelled as “Chicken Knick Knacks” and such, these are all the little goodies for each meal, so you know where it is! Be sure to check back this week…I’ll be posting parts 2, 3, and 4 (THE WINNER!) every couple days! Next up…Plated Review! Organize your New Year with Lawn Bags! What? Plated Review! Tried Three Different Services! Part 2 of 4!